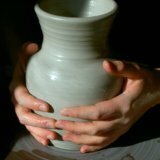 These beginning pottery lessons teach you how to make ceramics pots at home. Learn tips and techniques for popular clay pot projects. 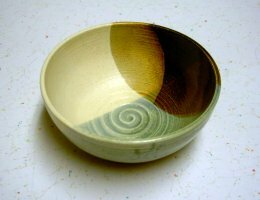 Find advice on use of kilns, tools, glaze, and more. 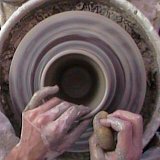 If you've never done pottery before, I recommend starting with the Make Your Own Pottery link. There you'll learn the basics of wheel throwing. 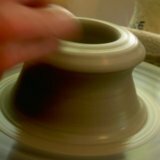 Here we'll learn specific techniques for forming and shaping a pottery bowl. From small bowls to intricate teapots, most pots start with the same three steps. First, center the clay. Next, open a hole in the clay. Third, pull up the walls. From that point, most projects branch off in their own direction. When making a bowl pull the walls straight up on that first pull. Second, thin the walls until they are about half an inch thick. Then, smooth and round out the rim. Finally, with one slow, steady motion stretch the walls outward into a nice bowl shape. Note: The walls will thin as you stretch them outward. To accomplish this stretching, use the same hand position as when you are thinning the walls. Your left fingers go inside. Your right hand holds the sponge on the outside. Rather than your right hand doing the pushing, your left hand does all the pushing from the inside, while your right hand merely supports the wall from the outside. Tip: Once the walls have been stretched out into a good bowl shape try to avoid more thinning and shaping. The walls are not as strong when they aren't straight up and down and may collapse. Slight refinements are usually okay and should be done. On the other hand, it's good to push the boundaries from time to time. Especially when you are first learning, you want to see how much the clay can handle. So if you do collapse a bowl or two or ten, don't worry. Just think of it as a good experiment. CONGRATULATIONS! You've just learned to make a bowl. 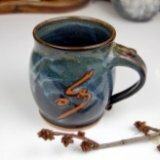 Learn more about pottery glazes for your project. Learn about ceramic tools and how to make your own for free.